By default, the Smart Connection panel shows all types of files: layouts, images, articles, Dossiers and so on. Most of the time though, you only want to see files of a certain type, especially when working with separate Smart Connection panels. This can be done by using the Smart Connection panel Filter. Step 1. Access the Smart Connection panel. Step 2. 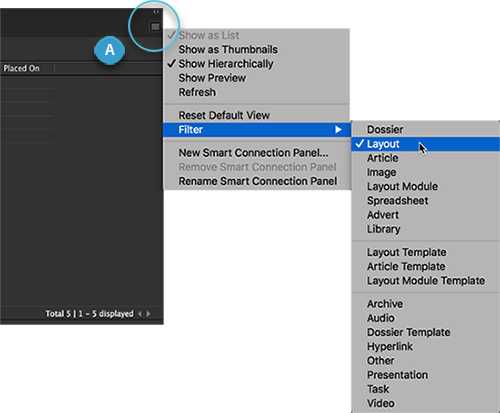 Make sure that the Smart Connection panel is run in Browse mode (which it is by default). Figure: The Smart Connection panel in Browse mode. Step 2a. From the Smart Connection panel menu, choose Show as List. Step 2b. From the Search menu, choose Browse. Figure: Accessing the Filter by clicking the panel menu button (A). The Filter appears, containing the file types that can be filtered on. 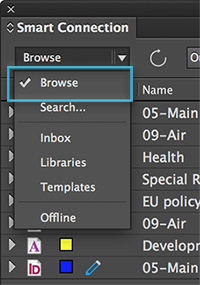 For more detailed information about searching for files, including creating and saving custom searches, see Searching and locating files using Smart Connection. 24 September 2018: Updated section 'Using the Filter' by updating the screenshots and adding a note.